For a character that we've seen roughly 2 seconds of, The Force Awakens' Ball Droid has created a weirdly excitable fandom. He's got his own parody twitter. People are tattooing him on themselves. 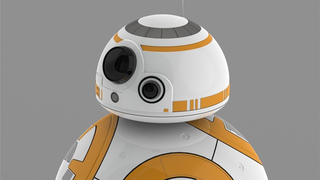 And now, months before Disney's merchandising mania truly starts up, you can 3D print a Ball Droid of your own. The 3D model was made by Thingiverse user Lilykill, who set to work shortly after the teaser trailer dropped on Friday to create a model he could 3D print. Because of the familiarity of scaling (and because I guess at this point incredibly detailed scaling information on the web at this point), the model is scaled so the head is the same diameter as R2-D2's, which seems a bit big for Ball Droid, but hey, I doubt the already rabid Ball Droid fanbase doesn't care if the model isn't 1:1 just yet. Lilykill even plans to edit the size of the model to be more accurate when there's more information out about the droid. Of course the 3D printed model doesn't come pre-painted - you print out the two pieces in whatever plastic you're using and then paint it yourself, but to be honest if you're going so far as to 3D print your own Ball Droid, I think you're the sort of person who'd be fine with painting it up too. You could paint it in your own colour scheme and create an army of Ball Droids, á la the vast amount of Astromech droids we've seen over the years! Got a 3D printer of your own or access to one? You can download the design here, for free. What does Ball Droid have to say about all this new fan love?